We have 3 great dogs. 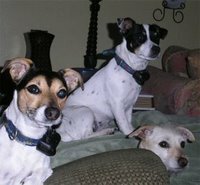 Only two are JRTs and the other is a terrier mix (unsure of which terrier). There's Bristow (our tri-color w/ a big overbite), Bennet (our puppy we refer to as Babe) and of course Dakota (our blond terrier mix who has the sweetest disposition).